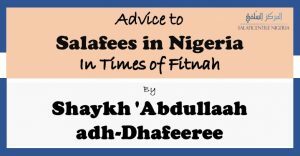 The following is some advice by the virtuous Shaykh ‘Abdullaah ibn Salfeeq adh-Dhafeeree (may Allah preserve him) regarding times of fitnah and how the Muslim should act in such times. In it, the Shaykh stresses on the importance of holding firmly to the Qur’aan and the Sunnah as well as sticking firmly to the ‘Ulamaa’ ar-Rabbaaniyoon particularly in times of fitnah. It was recorded on Friday, the 24th Jumada ath-Thaani 1440 (1st of March, 2019) in the Masjid of the Shaykh: Masjid Mu’aawiyah ibn Abee Sufyaan (may Allah be pleased with him and his father) in the city of Hafr al-Batin in Saudi Arabia. May Allah reward the Shaykh abundantly for his advice and may He benefit the Muslims by way of it.